There are 70 posts in this topic. You are on page 2 of 2. Hi, this one is Bride of Pinbot. Are you paying a price that’s hard to walk away from? If you are, then I would be extra cautious if I was the OP or someone else considering a similar offer. Just curious, why do Pinsiders hide their collections from other Pinsiders? I think some do it so they don't get unsolicited messages asking them to sell a certain pin. I live in New Zealand. I buy a stuff from overseas off ebay and other websites all the time, no problem. But buying pins from overseas is hard. Most don’t want to know you once they hear you are from overseas. This year I bought two pins from England. Both times I had to use a middleman in the UK to organise pickup packing and shipping and for one to make local payment. Used PayPal for the other. I know of another New Zealander who uses a middleman to pay cash and pickup from local sellers in the USA. Otherwise it’s pretty risky for the buyer too. Pay your money and maybe get no machine, so I get the whole middleman concept. 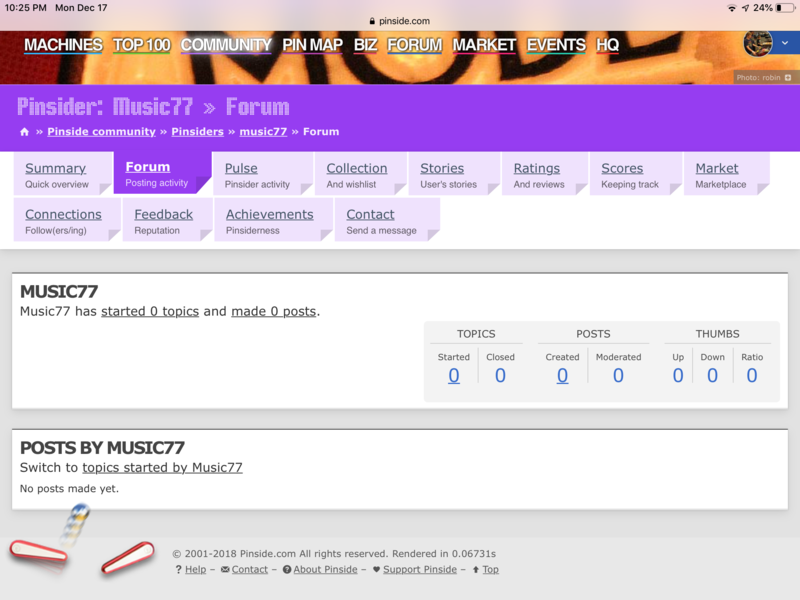 Strange that music77 has been acting as a broker for a while but with a new pinside account, so understandable the seller was wary. But I find it unlikely many US sellers would take an unsolicited offer directly from someone in Japan. Wish it was easier. When you live on an island, importing is sometimes the only way to get the pin that you want. That’s what I figured. I’ve solicited pins from guys based on their collection and foolishly paid above market price because I was new and just couldn’t wait (Flintstones and RFM come to mind). Nonetheless, I still like to see others’ collections. All they have to say is “no” to unsolicited offers. Thanks Music77 for chiming in. Appreciate it. My post was not calling you a scammer, but asking if anyone had dealt with you due to no posts on Pinside and being 42 days new. You had also claimed you bought other Pins from Pinsiders, but with no post history that is kind of odd. I also read Vid's guide to buying/selling Pins ... it's very similar to what we've used in other forums(other hobbies). I saw a lot of comments, but will just say, from a high-level, looking in to this transaction, it seemed off. I've bought and sold a few Pins from Pinsiders and there were usually a lot of questions about the machine. More photos/videos/etc. I believe you had one, something like 'I guess it works?' I also have a 20 year plus hobby of classic car restoration and buying/selling parts-matching items is a real PITA. People get ripped off all over the web, in any hobby, every day. At the end of the day, I was looking out for myself and other Pinsiders if it was a scam. This is the 1%. I wish you the best in your purchases. So... everybody egrees. Use escrow and be done. Sounds like someone new trying to acquire a few games. Win-win all around. What's preventing the sale now? Idiots will frequently obnoxiously drag collections into arguments. "Oh who cares what you think? You own SF2!!!" There's no point in me listing a collection. I don't care what anybody thinks of my collection and games change so frequently it would be annoying updating it every other week. I'm down with it if Music77 wants it. Then we can give this story a happy ending. I don’t get it, the guy offered to do a wire transfer. As long as it’s a true wire transfer, like a swift or ach payment, it almost impossible for someone to get it back. I’m glad people like using escrow, but we send and receive wires on a daily basis, and short of a credit card wire transfer, they are one of safest methods, while nearly impossible to reverse. Someone offers me a wire transfer and sends proof of transfer where I can see the funding source I am selling 100% of the time. The fedex lady thought it was a joke, but they forced it through. I called the customer and said my chain of responsibility ended at fedex, and if it’s lost it’s on them. Sure enough, 4 days later it was delivered and signed for, and the customer was happy. Still to this day I can’t believe that address worked and it turned out ok. There is definitely a ton of scams out there, but my experience has been more positive than negative, and after thousands of wire transfers we have yet to have an issue with one. Good luck to both buyer and seller and hopefully they can make it work. That address I would believe, no one would be stupid enough (or smart enough) to try that. It HAD to be real lol. Thanks for responding. As I mentioned when we spoke on the phone, I understand wanting to protect yourself in any transaction and wouldn’t have expected you to ship the machine until you received payment if we were using a bank transfer. The post seemed to have started off innocently enough, but the thread took a very quick turn into a negative direction where we were being labeled as scammers. Actions were taken that caused our account to get suspended. While in the grand scheme of things it may not have been that big of a deal, it seemed unnecessary. I don’t fault you for wanting feedback, but I think you were a little hasty with your conclusions. You had stated that I disappeared after you suggested using an escrow account. That suggestion came after I told you we would be using Citibank around three hours earlier. So yes if I receive a text that is random I may not be aware of it or may not be able to respond right away. I did respond back to you a couple of hours later letting you know I was working on getting the escrow set up and that your email address was required. I would have felt better if you brought that to light in the thread with an update at some point. Like, ok Music77 did respond and agreed to use my preferred method of payment. He also gave me a reference to contact who said he received a bank transfer a couple of weeks ago without any issues so far. I purchase items from eBay occasionally and fortunately I’ve only had a couple of issues. On the occasions when there was a problem I have contacted the seller and given them time to respond and a chance to rectify the situation. Thankfully we were always able to work something out and I never had to resort to leaving someone a bad review or rating. While these situations are different my point is that I take people’s reputations seriously and will not label them negatively based on a possibility but on an action that has actually occurred. My questions about the Pin were not extensive, but I don’t recall saying I guess it works. I believe it was listed as being in great condition and refurbished to an extent. I asked you about the condition in general and what had been done in the way of restoration. Not a big deal though. At the end of the day I’m not one who likes to dwell in drama, negativity or confusion. Given the option of going back and forth debating an issue or resolving it and moving on to more constructive uses of time and energy, I will almost always go with option B. We had counted this one as a loss and the buyer was disappointed, but understands the obstacles that can arise. That being said my objective is to make things work not the opposite, so the story with a happy ending works for me. I will give the buyer an update. If he tells us he still wants it, let’s make it happen. I notice you use the words "we" and "us" quite a bit. This makes me think that this might be a business for you with other folks besides just you. Are you part of a group that helps international buyers find items, like pinball machines? Ultimately, it's none of my business, but when you use phrases like "Actions were taken that caused our account to get suspended." and "If he tells us he still wants it" it makes me think that you're not working alone in this quest to find pinball machines. No, I’m not working alone, but there’s just a few us at the moment. We have a growing online business which isn’t related to pinball machines, but yes we began brokering a few different items under the same business name. I wonder how the Silver Ball Planet in Osaka, Japan gets all their pins? They have almost 100 pins form the 70s to the latest releases. Direct purchase, broker? The place is awesome. Check out their lineup. The newer stuff is 100yen/game (~$.90). They have the new Atari Pong table. A tech is onsite servicing games. So it had been 65 days since the last post but no update. Did this deal end up going through? Quoted from Micky:Did this deal end up going through? Yes it did. Game should be in Japan by now.